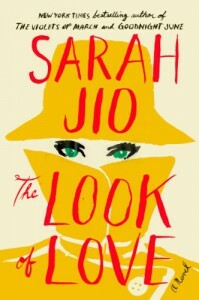 The Look of Love: A Novel - . It's no secret how much I loved [b:Goodnight June|18667906|Goodnight June|Sarah Jio|https://d.gr-assets.com/books/1383853074s/18667906.jpg|26493569], Sarah Jio's last novel, and I couldn't wait for the release of [b:The Look of Love|20893363|The Look of Love|Sarah Jio|https://d.gr-assets.com/books/1396802142s/20893363.jpg|40236367]. I was especially intrigued by how different the book sounded from anything I have ever read. I was in the mood for different, but what I didn't realize until I was completely enchanted by this book was how much I craved reading a love story, something truly heart-warming and emotion inducing. And not only do you get that with this new book by Jio, you get several love stories told by several perspectives, all connecting to Jane and her 'gift'. Jane has been told that she has a special gift of seeing when people are in love. Her entire life, she's been skeptical of love because she watched her father break her mother's heart. It was during that moment she first experienced her gift, but has spent her life seeing a doctor for what she's always thought was a tumor in her brain causing the vision issues. Now nearing her 30th birthday, and never having found true love, she's approached by a woman claiming she has the same gift and that Jane needs to fulfill her obligations of finding all of the types of love before her birthday, or risk never finding love herself. Of course, who wouldn't be skeptical of something so ridiculous. But as Jane thinks back to all of the times her vision has clouded over while looking at couples, she starts to believe in it's truth. Thus starting her year long quest to find all of the types of love. As most would expect with a book such as this, it was quite predictable. But it's that comfortable predictability that I needed right now, and I fell head over heals in love with this story, and Jane. Jane, who's been jaded about love her whole life, who mourns the loss of her beloved mother almost daily while she continues the legacy of her family flower shop. And once she learns of her gift, finally starts to witness love in all of it's forms. Unconditional love, heart-breaking love, all-consuming love - just a few examples that Jane witnesses among her friends and loved ones. She even stumbles on the possibility of love for herself along the way. So many passages in this book stuck with me, and I found myself highlighting on my Kindle quite often. Here are just a few of my favorites. "It's hard to put into words. It's as much a feeling as it is the way your stomach flutters when you think of him. It's the feeling of being reached and reaching someone. It's the feeling of being seen by someone for who you really are and being adored for it." "She could read him like a book, and even when she came across an unsavory passage, she never once set the book back on the shelf. She adored the story of their love, even the rocky chapters." "You can be happy anyplace when there is love." 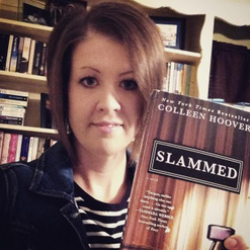 Love is a powerful, incredible force, and this book proves that in many ways. It's also messy and not always perfect. Where my heart broke for one couple, it would be bursting for another. I did find myself surprised by the turn of events a few times along the way, and I was even shocked by a few of them. But I finished this book with a huge smile on my face and my heart happy. It was just the heart-warming story I needed, perfect for this time of year.